Basic Lessons (30 minutes) are open to a wide range of ages and ability levels. 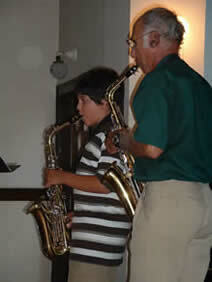 Enhanced Lessons (45 or 60 minutes) include additional instruction in music theory, composition or arranging. Students may enroll for lessons as space and instructor's schedules permit at any time September - July. There are two 18-week sessions (Fall and Spring) and a six-week Summer session. Tuition is prorated depending upon the number of weeks remaining in the session at the time of registration.